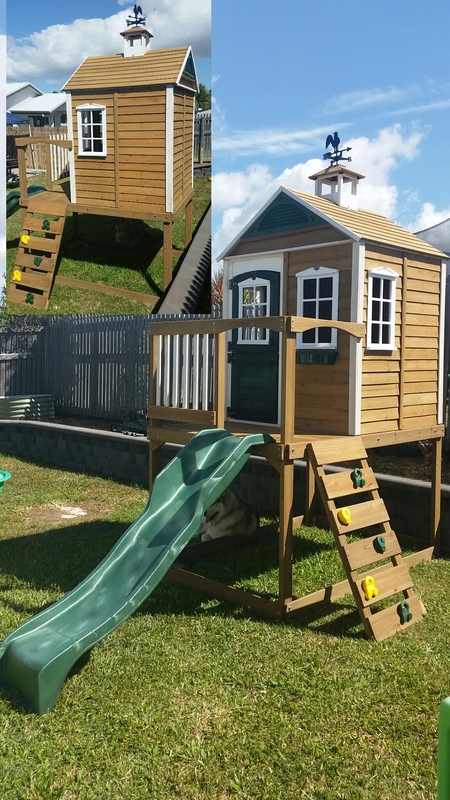 The Queensland Cubby House provides the perfect combination of a beautifully designed and crafted playhouse with some of the benefits of a climbing frame fort, with its rock wall ladder, slippery straight slide, balcony area and spacious sandpit play area. The upper deck of the Queensland fort is located 1.0 metres from ground level and is accessible via the six panelled rock wall ladder that features yellow and green rock wall mounts, which help to provide a more challenging climb for more advanced climbers. Once on the upper deck, there is a spacious balcony area protected by a wooden guard rail that will allow your children to look out over the garden below. Entrance into the playhouse is achieved through the green split front door, which leads into the roomy inner house. 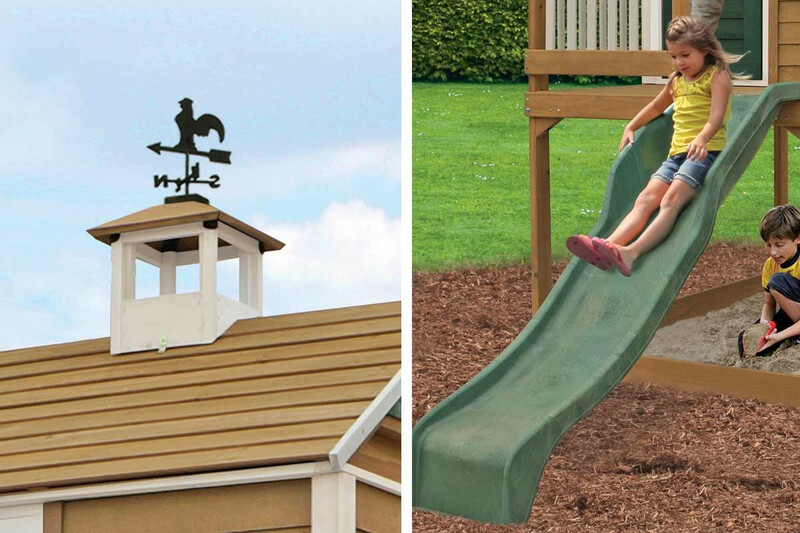 There are window spaces on both sides of the playhouse and also at the front, whilst a decorative weathervane marks the top of the Queensland fort. Outside the front window, there is a flower box, where your children can plant their own little flowers and plants. 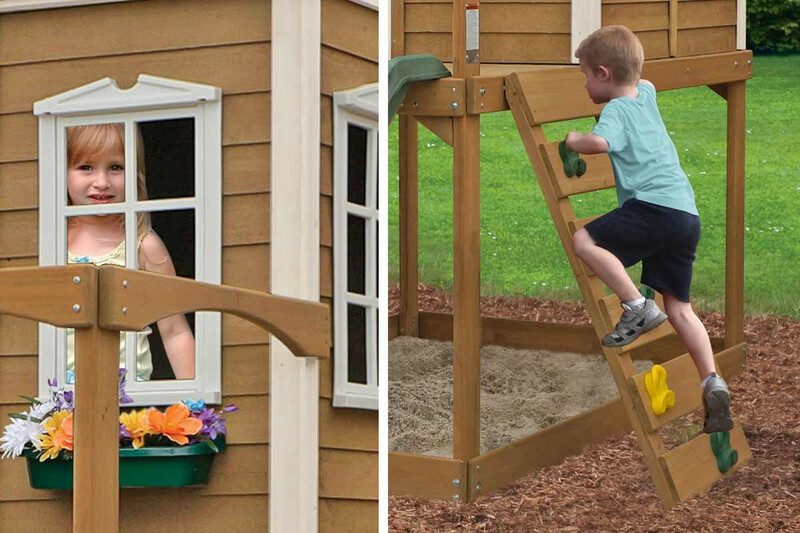 To get back to ground level your children will either be able to use the straight slippery slide or make their way down the rock wall ladder. Once back on terra firma, the fun doesn't stop thanks to the expansive sandpit area that is protected from the upper play fort area. We would recommend that before making this a sandpit area that you fitted a weed suppressant membrane before emptying any bags of play sand in the area. 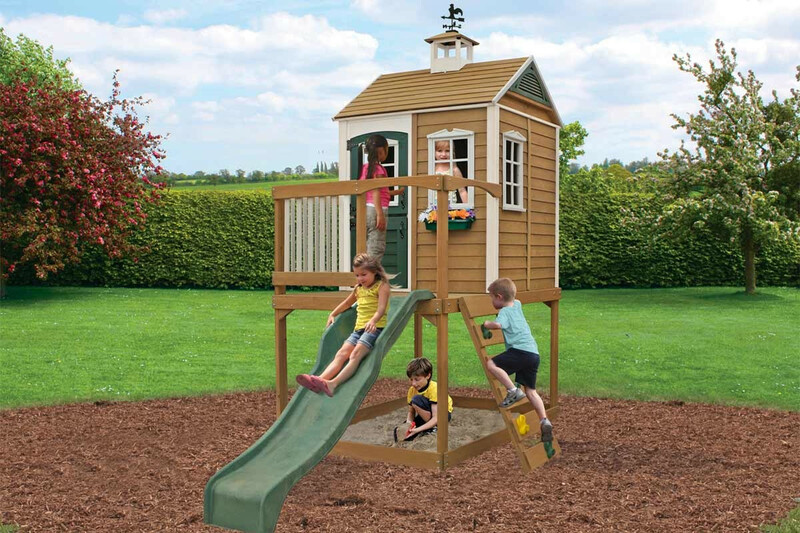 The Queensland Play Fort is a fantastic fort structure that will provide your children with hours of fun. Total height is 2.66m (from top of roof to ground). Total depth including slide: 3.38m. 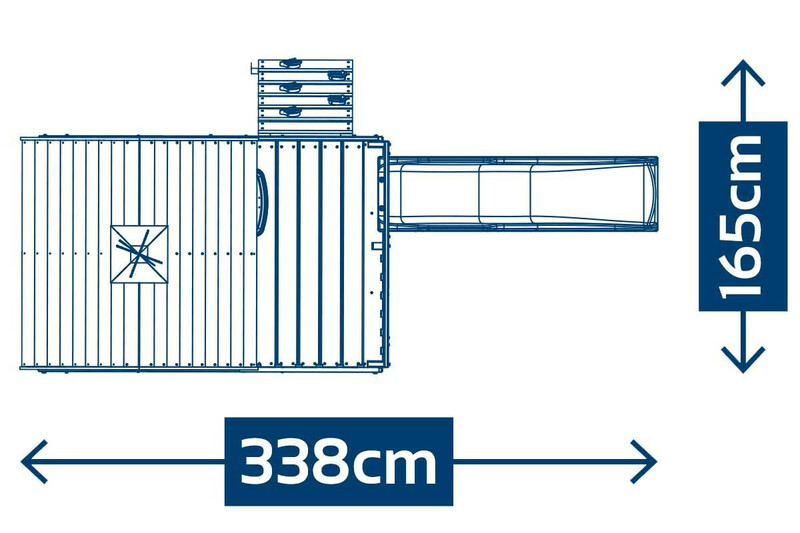 Depth without slide:1.83m. 1m deck height . 1.66m from deck to top of roof. Width of sandpit 1.2m. Width of sandpit including climbing wall: 1.7m. Height of door: 1.12m The play house is approx. 114cm in depth by 127cm in width. Je suis très content de cette aire de jeux. C'est exactement ce que nous espérions et nous l'avons acheté il y a bientôt trois ans. Les enfants (3 et 5 ans) l'adorent et jouent avec en permanence. C'est compacte et c'est joli dans un coin du jardin. Prévoyez beaucoup de temps pour l'assembler surtout si vous le faites seul ! Seulement quelques passages nécessitent l'aide d'une deuxième personne. Les instructions sont assez simples à suivre. J'ai eu besoin d'une pièce de remplacement et on m'en a envoyé une très rapidement. Superbe cabane ! Super produit à un super prix ! les enfants l'adorent ! Très bon produit. Mes garçons l'adorent. Prévoyez assez de temps devant vous pour monter toute la structure maisça a été sympa de faire ça avec les copains. Dans l'ensemble c'est un produit de qualité et il peut être facilement assemblé. Ça vous prendra plus d'un jour pour l'assembler complètement (plus si vos petites têtes blondes vous aident!) donc prévoyez assez de temps. Une fois fait, ça vaut le coup ! A part ça, la cabane amuse beaucoup mon fils et lui donne une grande variété de jeux : escalader, descendre le toboggan en glissant. We brought my niece this Queensland Play Fort and the Windale for christmas and set aside this weekend to finally make a start at putting the Clubhouse together. It took us 2 days (my partner and I) to put the Clubhouse together, a bit longer than we had anticipated. However, the final master piece was well worth it, all the attention to detail makes the set more visually appealing and attractive. We still have little bits and pieces around the clubhouse to complete eg. 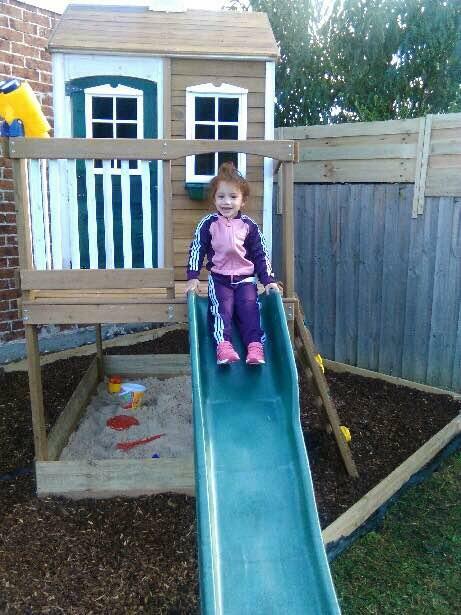 placing more bark, painting fence and the brick wall and assembling the Windale set next to it, but we are so happy with what we have completed so far and I am sure my niece and my expecting little girl in October this year will have years of fun with it. Reading the instructions is essential for all attention to detail and correct assembly. Some good tips on previous reviews, stain wood to preserve, spray surface spray on the inside to prevent spiders and cobwebs, added extra accessories including binoculars and telephone from Bunnings. Instead of digging a deeper hole for the sand pit for extra depth we attached another layer of fence palings for extra height around the sand pit area. The sandpit seems to be the most exciting feature for my niece at the moment, she has not stopped playing in her sandpit. Slide, door bell and rock climbing wall also lots of fun. Nothing can replace the look on her face when it was complete! We are looking forward to setting up the second set along side it! Happy Aunty and Uncle :) ! We bought this for our 3 year old and she loves it! She was stright up the ladder and down the slide. It was a little trickier to put together than expected, but worth it as its great quality. The only thing that is a shame is that the adults camt really get in as a bit tricky and a bit small and has a weight limit. Great play yard, out grandkids love it! 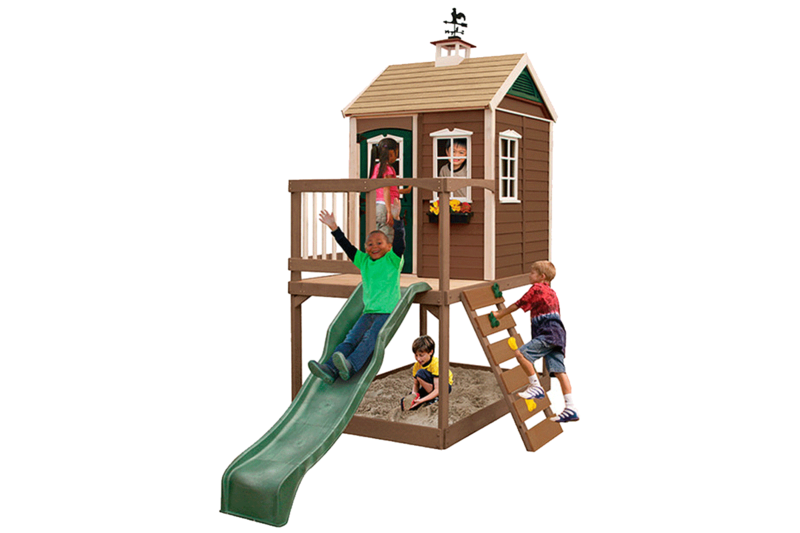 The play yard is made of good high quality wood and plastic. It took us a while to put together-much longer than the instuctions said, but the end result was well worth our time and effort! Overall, this is a quality fort that can be easily assembled. It will take a day or so to fully assemble (more if your little one is 'helping'!) so be prepared to spend some time on it. That said, the end result is well worth the time. My only niggle with this item is that the door latch provided does not fit the door (and yes, I followed the instructions in detail, twice!). Other than that, this fort is keeping my son entertained and gives him a variety of ways to play: from climbing and sliding to playing house and even turning the space below into a toy workshop / garage. 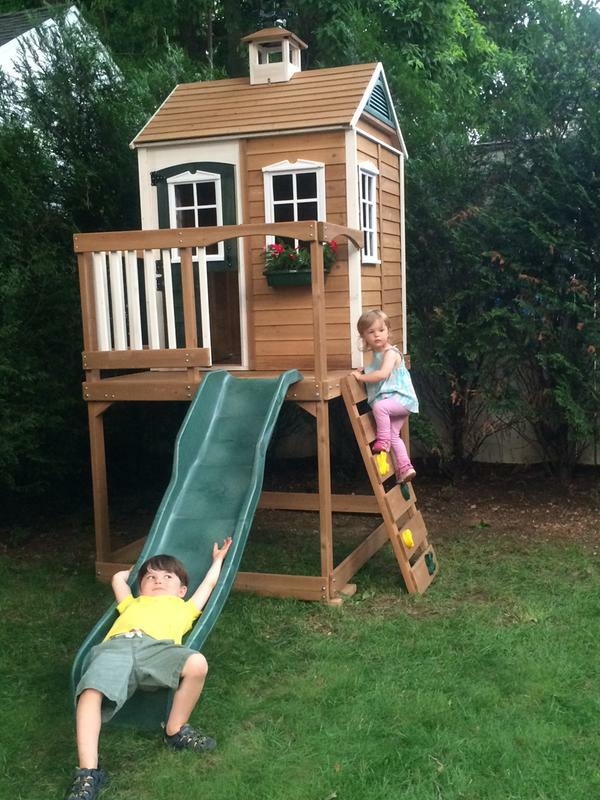 I am so happy with this playhouse. It is exactly what we hoped it would be when we bought almost a year ago. The kids (3 and 5) love it and play with it constantly. It is compact and fits nicely in a corner of our cozy backyard. Leave extra time for assembly, especially if you are primarily working alone! Only a few steps require a second set of hands. The directions were fairly easy to follow. I needed a replacement part and it was shipped to me immediately. Great playhouse! Our little Girl loves her Queensland Cubby she was so excited to see it finished . The image and written instructions was good & we did understand them. An time was 9 to 10 hrs like book said with two person. Some wood was cracked and split in same parts.